When you come into the Howard Assembly Room in Leeds Grand Theatre and hear the unforgettable strains of Captain Beefheart’s ‘Big Eyed Beans From Venus’ playing over the house PA – a song whose furious angular rhythms and general out-there weirdness are at fierce odds with the venue’s customarily sedate grandiloquence – you sense that this could turn out to be a very interesting evening. Speaking to the English folk musician Chris Wood during the interval of tonight’s performance he is acutely aware of his surroundings and tells me that he deliberately chose the good ol’ Captain’s Clear Spot album for his pre-show playlist “to scuff things up a bit”. And this is exactly what he proceeds to do for the entirety of his 90 minute set. 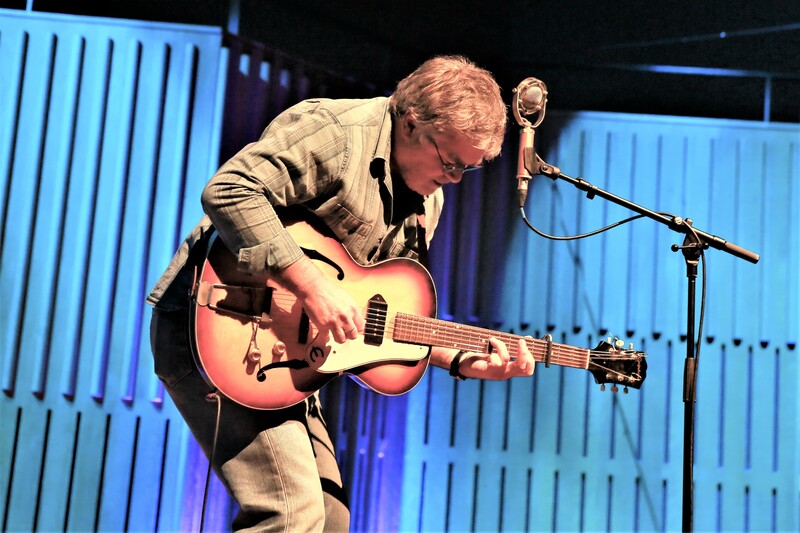 Chris Wood is so much more than just a mere folk musician. He is first and foremost a storyteller. A first-generation man of Kent with a quite remarkable eye for detail – be it in relation to the mundanities of our day-to-day lives or what is taking place in the wider world that surrounds us all – his observations are consistently sharp, intuitive and ripe with carefully controlled anger and discontent. Yet for all of his rightful indignation and dissatisfaction with the monstrous inequities that he sees around him in modern-day Britain (and far beyond), Wood is never without compassion or wry humour. He weaves his words into delicate, often mournful melodies that may well borrow from the grand folk tradition yet somehow remain far removed from it. He is undoubtedly a man of our time. After opening with ‘The Wild Wild Berry’ – a wonderful variant on a folk standard from darkest Shropshire – Chris Wood treats us to a number of his own deeply heartfelt tales whose subject matter range from his very first family sofa, an elderly allotment neighbour and his daughter leaving home to go to university (on the beautifully poignant ‘This Love Won’t Let You Fail’), all of which reflect upon themes of changing times, loss and yearning. A wonderful cover of Jake Thackray’s ‘To Do With You’ proves that Wood is as comfortable an interpreter of the songs of others as he is with his own material. During the interval, Chris Wood not only had time to talk to me but also scribble the setlist for the second half of the show on the back of his left hand. The words “Jerusalem, Hollow, Sweet, Whole” could be easily seen as he shaped the chords on his 1964 Epiphone Casino guitar, the sound from which retains the most gorgeous textured warmth throughout the entire evening. We did indeed get ‘Jerusalem’, Wood’s contemporary interpretation of the traditional song, stripping away much of the original’s faux-positivity and replacing this with a stark, revolutionary realism, and ‘Hollow Point’, an incredibly powerful and moving account of the murder in 2005 of Jean Charles de Menezes by armed officers of the Metropolitan Police. As with all of the principal topics of the day – be they Brexit, climate change or social exclusion – Wood approaches them from an oblique angle, conveying his message by stealth rather than with brute force. Given this and his earlier comments about “scuffing things up” it comes as no little surprise to hear him say he would love to see either Stewart Lee or Sleaford Mods appear in this venue. Mindful that Motown: The Musical is playing next door in the theatre’s main concert hall, Chris Wood delights us with a stunning cover of Smokey Robinson’s ‘I Second That Emotion’ before returning for a richly deserved encore of the legendary singer and banjo player Dock Boggs‘ haunting ballad ‘Bright Sunny South’. A song about a young man leaving his home at the time of the American Civil War it retains huge relevance today. Just like Chris Wood, in fact; a man for our troubled times. With thanks to Keith Belcher for help with the setlist.